If you've been hemming and hawing over whether to hop on your two-wheeler to get to school, June is the month for you. It's Bike Month across the country, and thousands of cyclists will hit the pavement in celebration of all things velo (that's Flemish slang for "bicycle"). 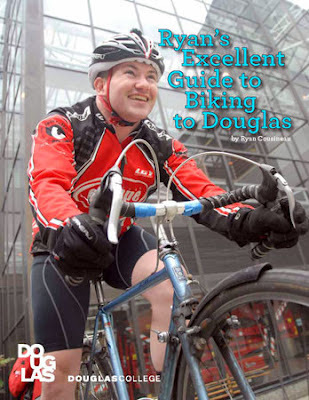 To help you get started on your cycling journey to the College, check out Ryan's Excellent Guide to Biking to Douglas, written by Douglas employee and bike-rider extraordinaire Ryan Cousineau. For more on Bike Month, visit the event's website. See the black dot at the far right of the sun? That's Venus in transit. Cloudy skies may have obscured our view of the solar eclipse last weekend, but another astronomical phenomenon is coming our way next week, and we've got the telescopes to prove it. 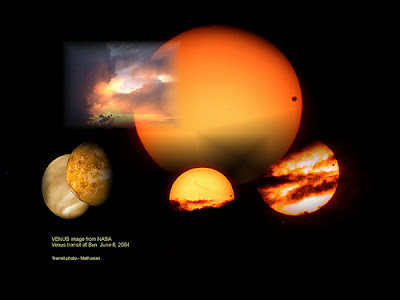 On Tuesday, June 5, the planet Venus will move across the face of the sun. The transit of Venus starts at 3:05pm our time and will end when the sun sets. The Department of Physics and Astronomy will have telescopes set up for safe solar viewing beginning at 2:30pm on the fourth floor patio, by the Aboriginal Gathering Place, at the New Westminster Campus. This will not happen again until the year 2117, so keep your fingers crossed for clear skies. If not, you will be able to watch the event live via webcast from Mauna Kei, Hawaii, in the Physics Lab, room 3720. Instructors Nancy Newman and Lawrence Becker invite you to take hybrid courses in social work - at your convenience. If you’re looking for ways to spice up your course load, the Community Social Service Worker (CSSW) Program is offering two hybrid courses to the wider community (so you can take them even if you are not a CSSW student). CSSW 1200 Introduction to Social Work Practice will be offered in hybrid format this Fall, and CSSW 1100 Introduction to Social Welfare will be offered in hybrid format in Winter 2013. Hybrid courses provide you with the flexibility of continuing your studies while keeping up with other commitments, such as work and family. With CSSW 1100 and 1200 you’ll only spend half the time on-campus in class as you would with a traditional delivery format. The rest of your time is flexible as you work on assignments designed by the instructor, such as quizzes, chat room discussions, multimedia presentations and more. For the Fall 2012 Semester, there are 4 things you need to know about fee deadlines, refunds and payments. 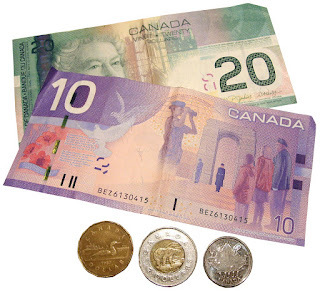 You can pay via Interac (in-person or online), cash, cheque or online banking. *To learn why Douglas College has joined other post-secondary institutions in no longer accepting credit cards payments, see the FAQ below. My Heart Takes Flight by Glenda Leznoff, painter and Creative Writing instructor at Douglas College. The Amelia Douglas Gallery invites you to take part in A Big To-DO: A Celebration of Art at Douglas College. This special group exhibit will showcase the vast and varied artistic talents of Douglas College students, staff and faculty. 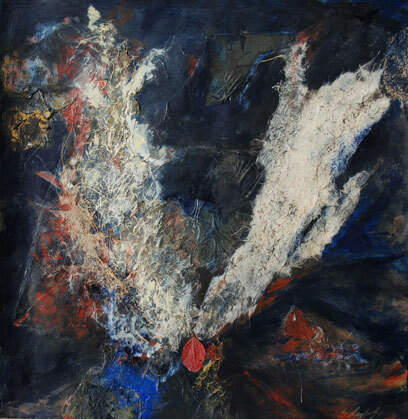 This diverse and collaborative show will run from Aug. 9–Sept. 14 and close with a public reception Sept. 13. Have fun: Get involved with Douglife! 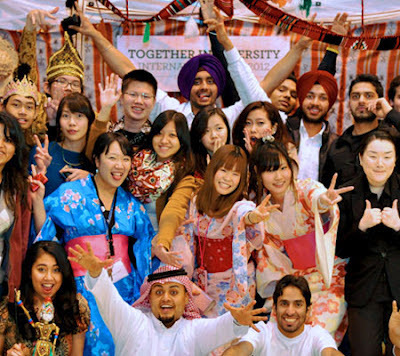 Students live it up at the 2nd annual International Day, one of the many fabulous events brought to you by Douglife. Want to discover the other half of the college experience? Douglife is your one-stop shop for activities outside of class, like white water rafting, poetry slams, beach volleyball tournies, volunteering and more. Douglife also supports student clubs and organizations, student leadership and wellness programs. We offer you fitness classes in yoga, kick boxing, core strength and basic step. The weight room is open from 8am-8pm Monday to Thursday, and 8am- 4:30pm on Friday. Volunteer opportunities exist on-campus and off. On-campus opportunities include helping run International Day and other events, while off-campus opportunities exist through a variety of organizations like the Red Cross and PoCoMo Youth Services. 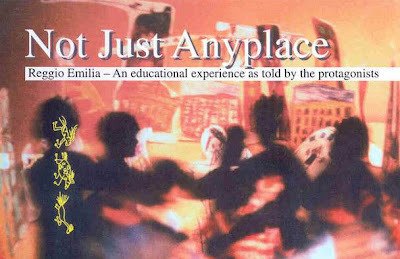 If you’re interested in Early Childhood Education, you won’t want to miss the screening of Not Just Any Place, a film about the history of the Reggio Emilia Approach to teaching preschool and primary school-age children. The screening is part of a fund raiser for the Wonder of Learning Exhibit, an exhibition of the infant/toddler centres and pre-schools of the Instituzione Municipality of Reggio Emilia, a region in Italy with some of the most innovative pre-school programs in the world. Donations are welcome at the door. A post-film discussion will be facilitated by Sue Fraser, Faculty Emeritus in the Faculty of Child, Family and Community Studies at Douglas College, and the author of Authentic Childhood: experiencing Reggio Emilia in the classroom. Twenty years ago, Early Childhood Education instructors from Douglas College joined the first Canadian delegation to Reggio Emilia. They came back with ideas that have been incorporated into teaching training programs across the country and that became the heart of the ECE program at Douglas. Part of the Reggio Emilia Approach is creating a supportive, inclusive environment for children and one that allows children to explore freely and gives them control over the direction of their learning. To register for the event, email Monica Freeman. For more information, visit wonderoflearningvancouver.com. Tim Frick, former head coach of the National Women's Wheelchair Basketball team and Douglas College Sport Science instructor, will be inducted into the Wheelchair Basketball Canada hall of fame May 20. Head coach for 19 years, Tim led the National Women's Wheelchair Basketball team to three Paralympic Games titles and four world championship gold medals. Prior to that, he coached Rick Hansen and Terry Fox. He retired from Douglas College in 2009. Read the full story on Tim in The Record. Miguel Kudry lives that edict. 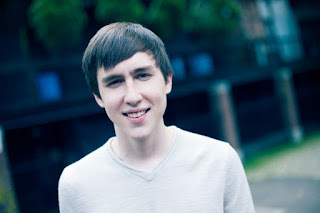 The Douglas College Commerce and Business Administration Diploma student and web entrepreneur recently launched a photo-sharing site called Floggia, which is starting to make waves. Floggia went live in January, and already boasts more than 1,600 users and upwards of 7,500 photos. 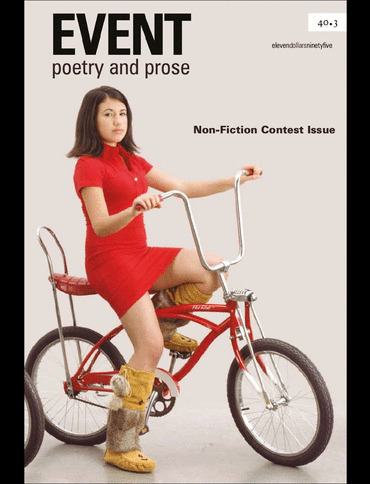 We're just half way through this week and already we've got great news: several stories from Event, the College's literary magazine, were nominated for two different awards - the Western Magazine Awards and the National Magazine Awards. Wayde Compton's "The Instrument" and Bill Gaston's "Four Corners" were nominated in the fiction category, while Chris Donahoe's "Busted" was nominated in the Personal Journalism category for the National Magazine Awards. Bill Gaston's "Four Corners" and Kate Millar's "Year of the Rooster" were nominated in the fiction category for the Western Magazine Awards. Need a bit of help developing your skills in reading, writing, math, basic computer use, as well as study strategies? Good news: the Learning Centre will get you up to speed this summer. If you want ongoing help with skill development, sign up to work with a peer-tutor for 50-minute, weekly appointments. Tutors will help you develop study skills, mastery of course content and writing skills. Spots fill up quickly, so sign up now! Tutoring Request Forms are available beginning May 7 on the Learning Centre website. The Learning Centre at both campuses have 25-minute drop-in times available for writing, study skills and course content help throughout the term. Beginning May 22, you can stop by during Learning Centre open hours, or log in to MyDouglas or online student registration to reserve a tutoring session up to one week in advance. Available May 13, online tutoring is to help you with your writing skills. Send in questions and drafts, and peer tutors provide their reactions as readers, but do not edit your writing. Tutors respond via email within 48 hours. Online tutoring also provides service in the evenings and on weekends. Submit your requests for online tutoring seven days a week, 24 hours a day. All Learning Centre tutoring is FREE to Douglas College students. Hours, locations, services and policies are available on the Learning Centre website. Bust out your trainers, slide on your tights and get ready to hit the pavement to raise awareness for mental health and fight the stigma surrounding mental illness. The second Miles for Mental Health run (5k) and walk (2.5k) takes place Saturday May 12 in Queen's Park, New Westminster, and you are invited to take part. Organized by the Canadian Mental Health Association - Simon Fraser Branch, a non-profit organization focused on raising awareness and funds for people with mental health challenges, the run/walk is the first of its kind in B.C. and is sponsored by Douglas College. "We need to do whatever we can to raise awareness of mental health issues and help remove the stigma and shame surrounding them," says Scott McAlpine, President of Douglas College. "Many of our programs focus on working with and supporting people with mental health problems, so this event is a perfect fit for Douglas. 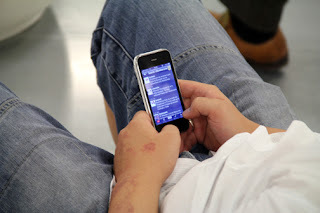 I encourage everyone to take part." You can register as a team, a family or an individual - everyone is welcome. It's a fun, inclusive event featuring music, food, an art exhibition and more. 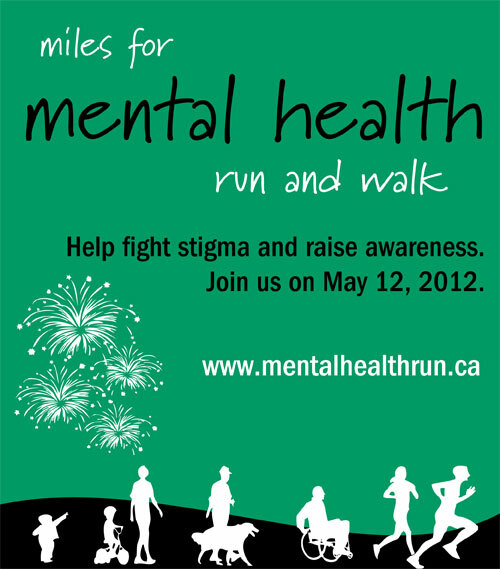 See Miles for Mental Health for all the details - and check out the video from last year's event. One Man Show is not a one-man show, but a show about producing a one-man show. You could call it theatre with a twist - a meta-twist. If this piques your interest, head over to the Douglas College Studio Theatre (New West Campus) next week to see an original play written by Stagecraft students Paul O'Shaughnessy and Andy Johnson and featuring actors from the Douglas College Theatre program. In the first act of One Man Show, set in the 1980s, two actors are shortlisted from the auditions. During the intermission, the audience votes to determine which actor gets the role. The second act changes somewhat, depending on which actor is selected. Beyond auditions and casting, the play covers the design, rehearsals and technical aspects of a production. "We hope(!) it is a comedy," says Paul. "That is our intention, and so far we are getting some laughs during our rehearsals." Fifteen other Stagecraft students are involved in designing and building the set, lighting, costumes, props, etc. for the show, which was made possible by a grant from the Douglas Students' Union. This is the first production by Stony Limits, an independent film and theatre company made up of students in the Stagecraft and Event Technology program. 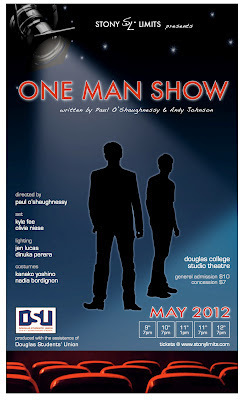 One Man Show runs May 9-12 at the Douglas College Studio Theatre, room 4140, 700 Royal Ave., New Westminster. Tickets (available online) are $10 general and $7 concession (student/senior/child). For more info visit the Stony Limits website or the One Man Show Facebook page. Urban gardeners partner with UNIBUG to fight insects the natural way. If you love gardening but hate the thought of spraying chemicals on your plants to stave off pests, you won’t want to miss What’s Wriggling in Your Rhubarb? 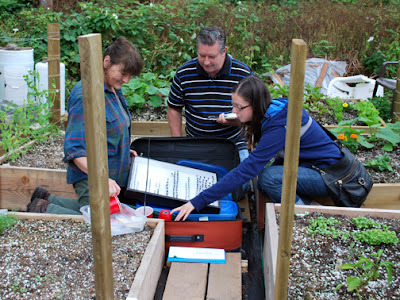 UNIBUG and the biological control of insects, at Douglas College next week. At the free forum, put on by the College’s Institute of Urban Ecology, you’ll learn about UNIBUG – the User Network for Insect Biology in the Urban Garden – and how to become involved with fighting insects the natural way: through planting flora that attract beneficial insects – or good bugs that eat bad bugs – to your garden.